Flangers are known as a guitar effect for a long time. They were later also used for drums or vocals. FLAN-W is a free flanger effect for Windows VST hosts. The speed, depth and feedback of the effect can be adjusted in a wide range. FRACTURE is a FREE buffer effect plugin geared toward creating robotic artifacts and abstract musical malfunctions. Fracture features a buffer effect, a multimode filter, three LFOs and a delay. This plugin is geared toward adding glitchy articulations and abstract textures to your projects. Use it on anything from drum and percussion loops to synth lines and sound effects. Fracture’s intuitive interface and diverse features make it simple to give your projects a unique technical edge. 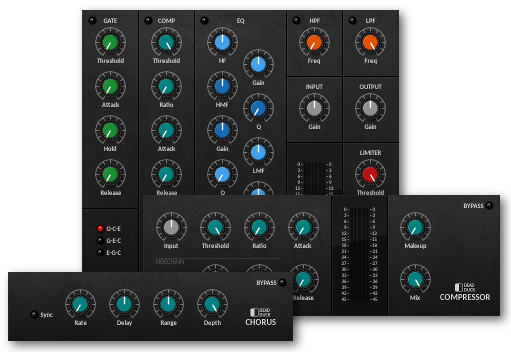 B.Serrano has released IO, a free collection of VST effects for Windows. These effects are driven by a sophosticated GUI envelope. de la Mancha has announced that unstable is now available for free. unstable likes to mess around with your audio pitch, with 3 subtle pitch modulation modes to simulate the unpredictable but lovable pitch instability of an old tape machine or an analogue synth. It doesn't only do subtle though, you can also put it in 'insane' mode if you'd rather just FSU. glitchmachines hysteresis is now free. HYSTERESIS is a FREE glitch delay plugin geared toward creating robotic artifacts and abstract musical malfunctions. Hysteresis features a delay effect with stutter, lowpass filter and modulation effects thrown into the feedback signal path. Easily infuse your projects with glitchy articulations and abstract textures. Process anything from drums and percussion to synth lines and sound effects. On top of being able to create incredibly wild signal mutations, it can also be used to generate classic delay effects. TDR Kotelnikov is a wideband dynamics processor combining high fidelity dynamic range control with deep musical flexibility. As a descendant of the venerable TDR Feedback Compressor product family, Kotelnikov has directly inherited several unique features such as a proven control scheme, individual release control for peak and RMS content, an intuitive user interface, and powerful, state of the art, high-precision algorithms. LFOX it´s a plugin for woobling and sweep your sounds. This plugin is gifted of 2 filters and 2 LFO´s. Each LFO has a fully range of targets into the filters, making you be able of woobling cutoff, resonance or both on both filters. The speed of each LFO goes from 16b into 1/16, has a free speed knob, and each LFO also counts with waveform (sin/ramp/tri/saw) and mode of playing, random and transport run, for sync. 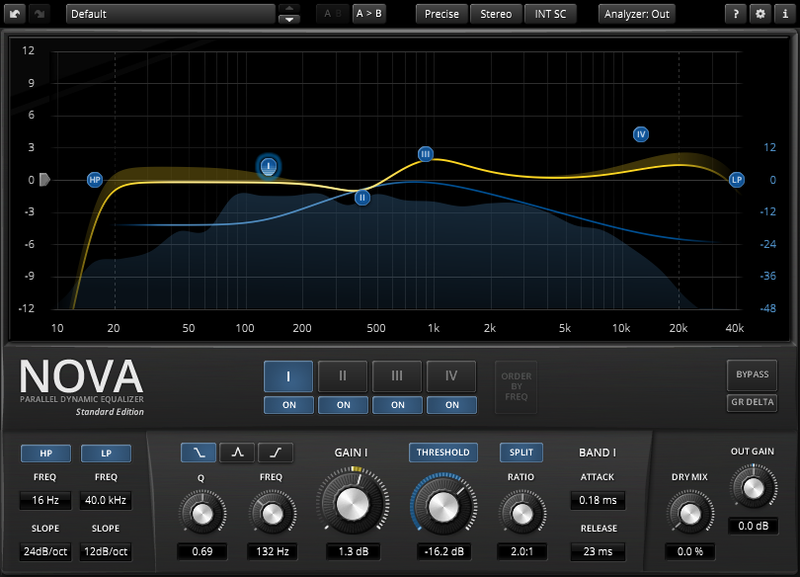 NOVA is a parallel dynamic equalizer. Appearing in the familiar layout of a parametric equalizer, each band also includes a full featured dynamics section allowing the processor to cover an impressively wide range of applications. Be it a master lacking density, the drum bus asking for more crispiness, or a sibilance problem in your perfect take: NOVA has an elegant answer. T-Chain is a channel strip plugin like no other. It utilizes a modular design so users can arrange different sound modules within the signal path. It can be as simple as using a single EQ or Compressor module, or as complex as you can imagine. Each module can be rearranged, added, and deleted by drag-and-drop - making it easy to rearrange your signal chain at-will. Good alternative to old Kjaerhus Classic Series! **** - I have been having trouble figuring out why I was getting a lag, turned out I needed to turn the prebuffer to none and the timing comes into place, this wasnt exactly obvious and I have to make this change every time I load a loop , something like this should probably be a vsti instead of a vst, but it works with plugin bridge and in 64bit modplug, I dont use 64bit and so the fact that it works with bridge was a plus. There is no available download link anymore. You will find that happening with many free plugins over the years (the post you are quoting is 13 years old!) and it doesn't make sense to point out every dead link because of that. Generally I would advice against using such old plugins even if you can find a working download link because if they are not maintained anymore, chances are high that they have issues with newer operating systems, hosts or technologies (such as high-DPI screens or 64-bit processors) that will never be fixed. Try reading this thread back to front rather than front to back as it will be much more likely that you will find working download links that way. » No support, bug reports, feature requests via private messages - they will not be answered. Use the forums and the issue tracker so that everyone can benefit from your post.